These two REITs could produce amazing returns over the long run. There's no guaranteed way to get rich in the stock market, but there are ways to stack the odds in your favor over the long run. Investing in stocks that have low-risk business models, but also have potential for market-beating total returns, is the time-tested best method to build massive wealth over time. Here are two real estate investment trusts (REITs) that can help you do just that. Ventas (NYSE:VTR) is one of the largest REITs specializing in healthcare properties. As of this writing, Ventas has about 1,300 properties, and the majority (54%) of the company's portfolio consists of senior housing, with large holdings in medical office buildings (19%), hospital properties (12%), and life science buildings (5%). Most of the properties are in attractive, high-barrier-to-entry markets with affluent residents. There are several reasons to invest in healthcare real estate over the next few decades. For starters, the market is expected to grow tremendously as the U.S. population ages. The 75-and-older age group is growing seven times faster than the overall population, and this group spends five times as much on healthcare. In addition, the approximately $1 trillion market is highly fragmented, with no REIT holding more than a 3% market share. In fact, less than 15% of all healthcare real estate is owned by REITs -- far less than most other types of real estate. So, in addition to the growth potential I discussed above, this means that there is tremendous room for consolidation within the existing market. Finally, the recent election could have a positive impact on the industry. Republican administrations generally favor lower regulations and private, for-profit healthcare. Ventas has delivered impressive performance, averaging 11% annual FFO growth and 10% dividend growth over the past 15 years, and currently pays a 4.8% dividend yield. Since the stock has fallen by about 21% over the past few months, mainly on interest rate fears and general sector weakness, now can be a great time to get into this long-term wealth creator. The self-storage business is an attractive one, and Extra Space Storage (NYSE:EXR) could be a great way to capitalize on it over the long term. The company has more than 1,400 facilities with about 107 million square feet of space, and the company has expanded rapidly over the past decade. Extra Space Storage has a market cap of about $10 billion, and has acquired $4.8 billion worth of its properties in the past five years alone. Image Source: Extra Space Storage. In addition to growth by acquisitions, Extra Space has done a great job of generating more revenue from its existing facilities. As of the most recent quarter, the company has grown its same-store net operating income (NOI) by 7.8% year-over-year, and has outperformed its peers over the long run in terms of revenue growth versus expense increases. Occupancy levels in self-storage facilities are at an all-time high and the per-capita use of self-storage is growing, which gives operators pricing power and means that there is room to expand. Like the healthcare real estate industry, the storage business is rather fragmented and is young in terms of REIT presence, which creates opportunity for consolidation within the existing market. Additionally, self-storage facilities are highly recession-resistant in terms of profitability. Turnover costs and other general operating expenses are low compared with other types of real estate, and fellow storage REIT Public Storage has said that it needs just 30% occupancy to break even. Over the past 10 years, Extra Space Storage has produced a 591% total return (21% annualized) for its shareholders, which is actually the best performance of any REIT over the same period. With the stock down 24% since late July and an attractive 4.4% dividend yield, here's a chance to get into a rapidly growing, recession-resistant business at a discount. I would call both stocks low-risk from a long-term perspective, but keep in mind that low-risk and risk-free are two very different things. I already mentioned interest rates as a reason for the sector's poor performance over the past few months, and this could become even more of a negative catalyst if rates rise faster than expected in the future. 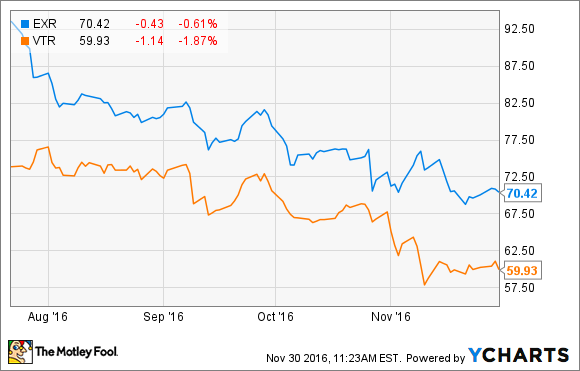 In addition, both of these REITs have industry-specific risks as well. A recession could easily make Ventas' occupancy rates drop (the company relies mainly on private-pay revenue), or healthcare spending could rise slower than the market expects. In Extra Space Storage's case, the industry trends could reverse in a downturn, which would cause profits to drop. The bottom line is that there are likely to be ups and downs with both stocks, but for long-term investors, the reward potential outweighs the risks.